The artwork in this exhibition showcases diverse representational and conceptual explorations of how the idea of the future is constant and inevitable for all people, animals, buildings, memories and all other man-made and natural things. In constructing their pieces, the artists were inspired by the selection of three words from The Toronto Word Pool (TWP) which is a collection of high-frequency nouns, adjectives, and verbs taken originally from the Thorndike-Lorge (1944) norms. The result is a diverse collection of works that are both simple and complex and capture many forms, shapes, sizes, materials, patterns, and connections. They are all a potential means to contemplate what the future means to each of us and how we develop our own utopia. In addition, the exhibit is enriched with the vibrant work of a younger audience. Several showcased artists took part in a participatory art event at JOUEZ, BIG on Bloor festival in July 2018. The artists invited the audience to select their own words and paint their visions of the future. 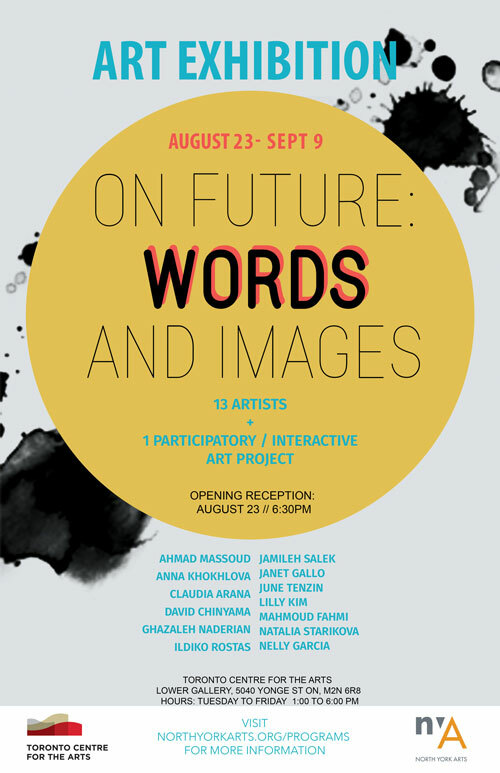 The resulting artwork is presented as part of this exhibition. This session will be recorded. Images and audio may be broadcast, reproduced and/or made available in print publications, online or on mobile devices, and may form part of one or more audiovisual productions intended for initial release on the internet, television and on home or mobile devices. By registering to attend and attending this event, you are consenting to the use of your appearance, image, and voice in the production and in any promotion or use of the production in any media throughout the world.